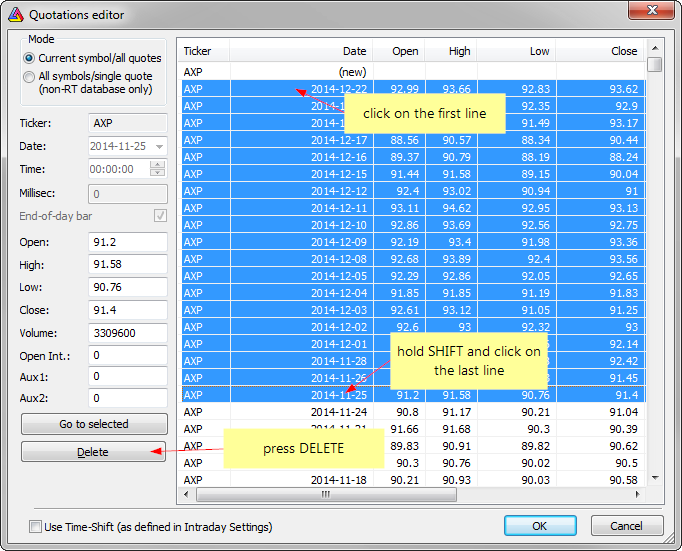 In order to delete quotations from a local database manually, we can use Quotations Editor (Symbol–>Quote Editor), then mark the required range of quotes and press Delete button. To mark a range – it is enough to click on the first line of the range, then scroll to the other line, hold SHIFT and click on the end-line of the range. To multi-select individual lines, hold down CTRL key while clicking on the lines. The code above is intended to be used from the outside of AmiBroker.